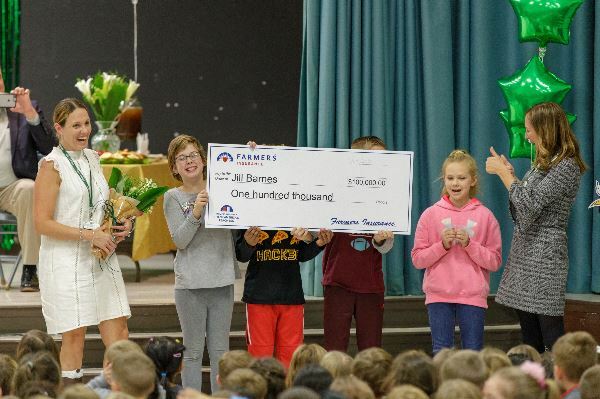 Valley ES Literacy Specialist Jill Barnes wrote the proposal and so many people voted their support after her project made the nation's top 15 that FCPS won the Farmers Insurance Thank America's Teachers Dream Big Teacher Challenge $100,000 prize! See the news release. 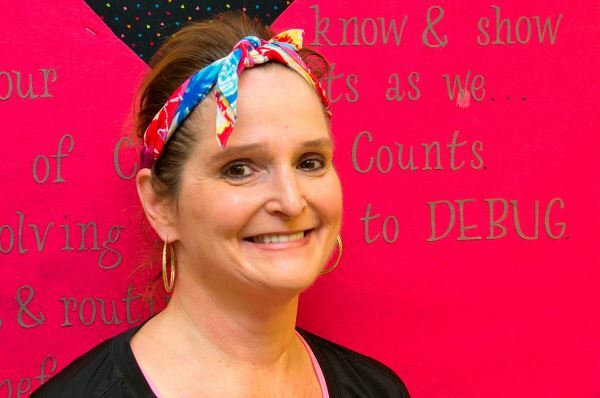 Orchard Grove ES special education teacher Judy Thornton "is a master teacher with a growth mindset and a deep commitment to all whom she serves," says Principal Shirley Olsen. 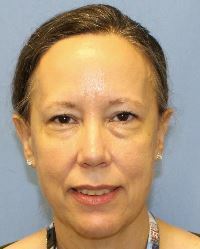 "Judy loves her students and balances care and concern with high expectations for each child. She is constantly willing to learn and grow in her knowledge of the curriculum, instructional practices, and technology; she taps the expertise of other cadre members, her co-teachers and grade-level teams that she supports in her role as a special educator," she adds. A colleague appreciates that Ms. Thornton "models new strategies for others so that we are not just better teachers but better PEOPLE for being in her company. She is a kind, patient and loving teacher, changing lives. I know because she has changed mine," explains the co-worker who nominated Ms. Thornton for the All-Star Award. Congratulations to Judy Thornton and all staff earning FCPS All-Star Awards since our October newsletter: Jennifer Amsley, Vernon Beals, Denise Brown, Patricia Brownlow, Carole Carr, Kelly Gordon, Beverly Jenkins-Bowens, Dawn Lynch, Sarah Presnell, Katie Rudman and Meghan Schickton. FCPS OUTPACES STATE AND NATION Once again our graduating seniors' scores outpace Maryland's and the nation's on the SAT exam. For the 2018 exam, our combined SAT score is 83 points higher than Maryland's and 100 points higher than the nation's. For details: FCPS Scores Outpace State and Nation. Kudos to all staff who made this achievement possible. 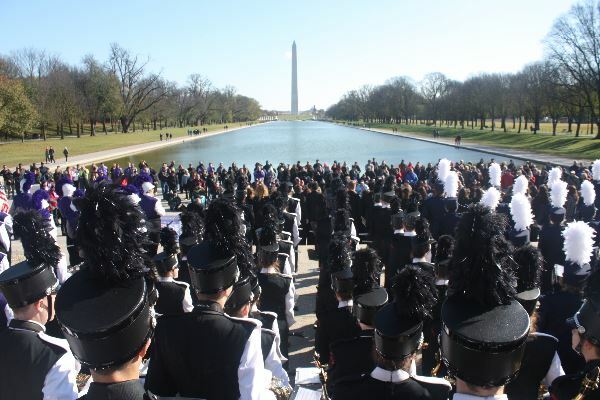 HONORING VETERANS The Linganore HS Lancer Marching Band performed for Veterans Day ceremonies in Washington, DC, alongside groups from California, Illinois and South Carolina. 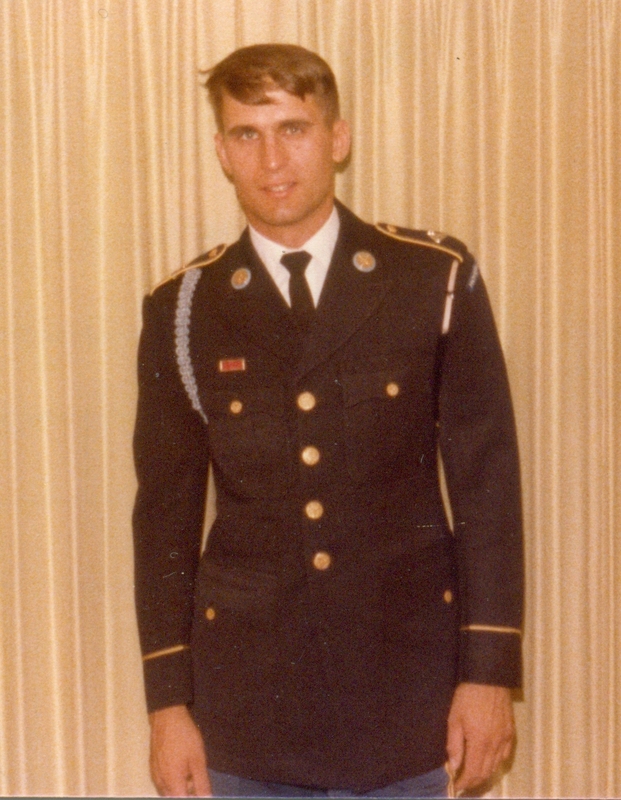 After playing at the Lincoln and WWII memorials, the band visited Union Station, the National Building Museum and the National Portrait Gallery. 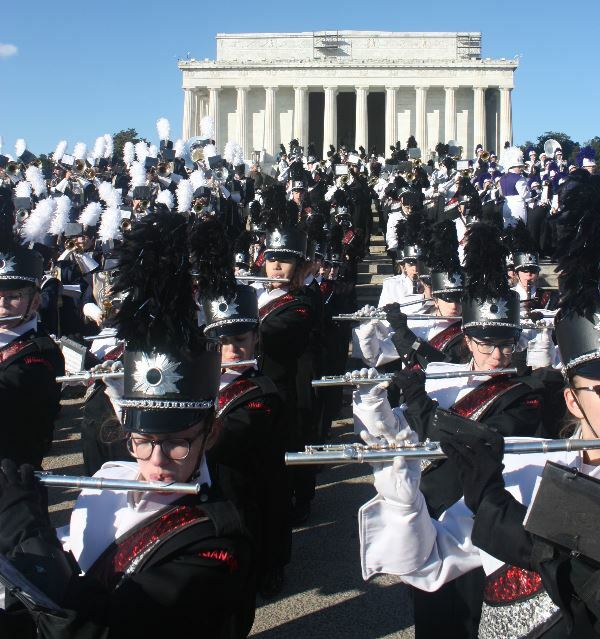 Director of Bands Kevin Lloyd also chairs the Linganore HS Performing Arts Department. SERVICE There were nine nominees for the second annual FCPS Veteran in Education Service Award. 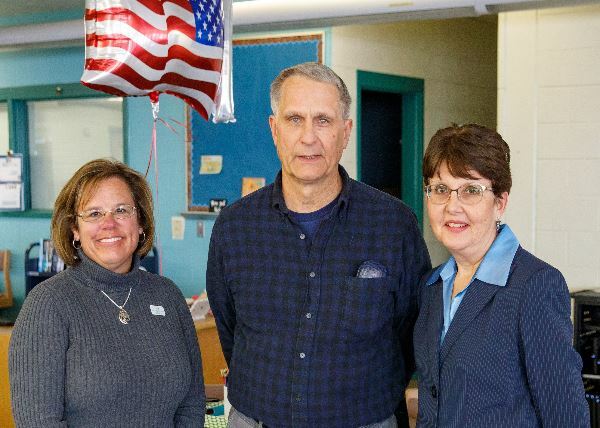 The winner, Urbana HS social studies teacher Fritz Baclawski, is shown above, flanked by Woodsboro Bank Senior Vice President Kim Arnold (left) and Superintendent Dr. Terry Alban. Congratulations to Mr. Baclawski and nominees Pamela Adams-Campbell, Andy Brown, David Goto, Tambuzi Pannell, Dr. Christine Samuels, Dr. Edward Schoder, Brian Smith, and Charles Welch. Look for familiar faces in this year's video tribute to FCPS veterans. NATION'S TOP 30 Parkway ES Media Specialist Erin Clagett earned her school a collection of books and art supplies from HarperCollins, placing in the nation's top 30 finalists among 15,000 entries in a library makeover contest! REGIONAL RECOGNITION FCPS earned a regional Award of Merit in the Financial Information category from the National School Public Relations Chesapeake Chapter for the FCPS Adopted Operating Budget 2018 publication. 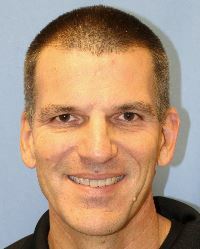 Communication Services Multimedia Graphics Coordinator Kyle Raines designed the report. EXPERTISE Congratulations to Dr. Jamie Aliveto! She has completed her doctorate in educational leadership. NEW FACES IN KEY PLACES FCPS welcomes former Frederick County Sheriff's Deputy Keith Robeson as School Security and Emergency Management specialist and former Child Advocacy Center of Frederick County Director Lynn Davis as mental health coordinator. WELLNESS Register now for this year's Health for the Holidays Challenge, which starts Monday, December 3. The first 100 participants receive a stainless steel straw and reusable utensils. The school/location with the most participants wins six weeks of fitness class. Winning team members each earn a weighted blanket. The person with the most steps earns a FitBit Versa Smart Watch. STAR RATINGS Are you ready for Maryland's new accountability reports? In December, Maryland will issue each school a "report card" with a 1-5 star rating based on test scores, access to a great curriculum, absenteeism rates, school climate, college and career readiness, and student growth. See the elementary, middle and/or high school videos and slide presentation with a sample report card. CALENDAR The BOE is gathering feedback on the draft proposed 2019-2020 school calendar posted at www.fcps.org/calendar through Wednesday, December 5. Staff feedback is welcome at fcpsmd@fcps.org. The Board will discuss the proposed calendar at its regular meeting Wednesday, December 12. $$$ The FCPS Community Budget Forum is Wednesday, December 5, from 7-8 PM in the Central Office Board Room. See this year's budget calendar and the related news release: What Are Your School Budget Priorities? TESTING FOR LEAD FCPS posts results of tests for lead in school drinking water, adding more schools as we receive the reports. Please check the results page until you see your school's reports. All should be completed before January. DEADLINE EXTENDED You may still send a Combined Charities Campaign donation if you contact Chastidy.Thomas@fcps.org soon! Feel free to designate your giving to charities that benefit local children, knowing that even small amounts from individuals add up to significant support for our most vulnerable residents.